Everything looks better from the seat of a bike. You can feel the wind on your face, the rhythm of the ground in your legs, you can feel your heart pumping, and the energy of your surroundings encompassing your body. On a bicycle, you can see the city, talk to strangers, escape the insulated bubbles of cars and feel free from the confines of cubicles. A bicycle is freedom, a bicycle is friendly, and a bicycle is life. San Jose is the largest city in Northern California, but we are hidden in the suburban sprawl. It’s time to enjoy the South Bay, ride the streets, and make this place the active and exciting city we want it to be. San Jose Bike Party is a place to ride bikes, make friends, and have a good time. We meet the third Friday of each month at 8:00pm. The start up location and route is rotated monthly. 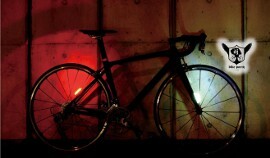 SUSTAINABLE: Bicycling is low-cost, energy-efficient, and healthy. 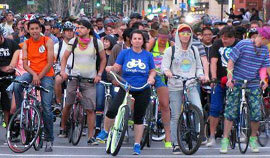 Bike Party rides aim to demonstrate a tangible alternative to car-based transportation and continue to provide a focal point for the local bike-friendly community for the long term. We aim to leave no trace behind except a good will towards cyclists in the areas we travel. EMPOWERING & INCLUSIVE: Bicycling frees people from costly fees, stuffy cars, sedentary lifestyles, and dreadful commutes. Bike Party rides aim to teach riders the street skills and confidence they need to become daily riders on all kinds of roads. Riders of all ages, skills, and styles of bikes are welcome at Bike Party. COLLABORATIVE & TRANSPARENT: Bicycling has many allies, from environmentalists to urban planners to conservationists to health advocates. Bike Party aims to collaborate with the many local and regional organizations whose missions dovetail with our own, from local businesses and governments to bike advocacy and cultural organizations. Bike Party aims to operate transparently and work together with all who hope to create a better, more bike-friendly city. LOCAL: Bicycling is the ultimate local transportation – a person on a bike will intimately know the streets she travels and easily explore diverse areas and encounter personal interactions everywhere. Bike Party rides explore different neighborhoods and streets of the San Jose area and with every ride it builds familiarity and connection with our proud city. San Jose residents deserve alternatives activities and a world-class bike ride provides the stepping stone to make the city a happier place to live. We love San Jose. If you need to contact us, please email sjbikeparty at gmail dot com.